Below, the author compares Appium to Selenium, and explains how you can make the most of whichever tool you decide to use. Is mobile application testing any different than normal software testing? While software testers' lives might be easier if the answer to that question were "no," that is not the case, of course. Mobile testing is different in all sorts of ways. You need to test for different things, and there is usually a wider range of devices to support when it comes to mobile. But perhaps the biggest difference is that one of the most popular testing tools for mobile apps is Appium, whereas Selenium is more common for non-mobile testing. These tools work in different ways, with important implications for the level of automation you can introduce to your tests. 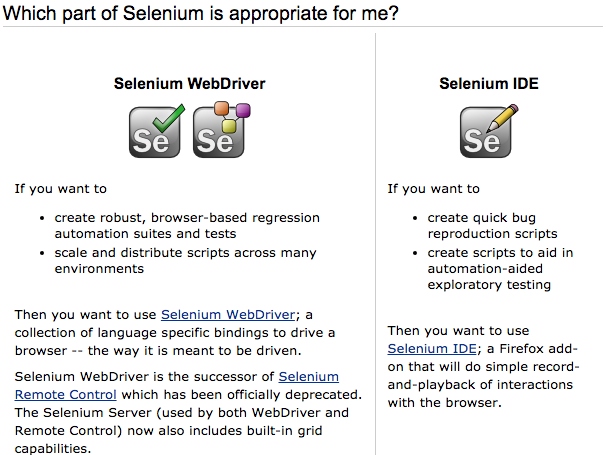 Below, I compare Appium to Selenium, and explain how you can make the most of whichever tool you decide to use. Selenium, the well-known web browser automation suite of tools, is an essential ingredient for testing because it automates browser testing. This means Selenium is not only useful for automating tests for web applications - It also can automate online administration tasks. DevOps Engineers get two for the price of one by using Selenium. Figure 1 below shows the characteristics of these two very functional tools for web browser testing. Selenium is supported by the greatest number of browser vendors, and version 3.0 has just been released. The big drawback of Selenium, especially in today's mobile-centric world, is that Selenium itself was not designed for automating tests for mobile apps. But fret not. This is where Appium comes in. Alongside Selendroid, Appium is a framework based on Selenium that was specially created for mobile automated testing. You shouldn't have to recompile your app or modify it in any way in order to automate it. You shouldn't be locked into a specific language or framework to write and run your tests. A mobile automation framework shouldn't reinvent the wheel when it comes to automation APIs. How does Appium architecture meet the Appium philosophy? Appium is an HTTP webserver, written in Node.js using a REST API. Recompiling apps is not necessary, because Appium utilizes vender-provided automation frameworks like Apple's UIAutomation or Google's UiAutomator. This way, the app you test is the app delivered. Last but not least, Appium is open source. Complete information on the Appium architecture is freely available on GitHub. A session is, in fact, the automation of your specific mobile browser test in Appium. Every client sends an HTTP POST-request to the server with a "desired capabilities" object (a JSON object). Now, the server will start up the session and respond with a session ID which will be used further in the session. As you can see, Appium is a great way to automate your mobile web application testing. Mobile application testing is very different from normal web application testing due to the various devices and versions of operating systems. But browser automation tools like Selenium can be used for mobile test automation by modifying the framework, similar to Appium. Of course, whether you need to use Selenium or Appium, you can easily leverage both tools via Sauce Labs' cloud-based testing platform. Published at DZone with permission of Cordny Nederkoorn , DZone MVB. See the original article here.